If you’re like me, you need things written down! 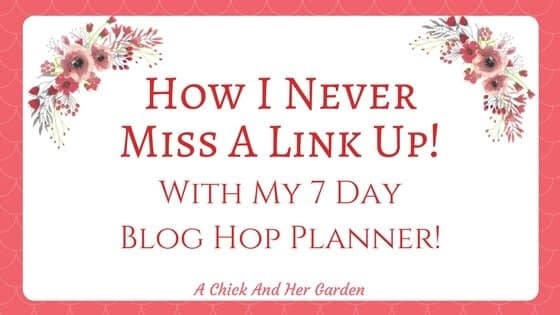 This 7 day blog hop planner will keep you on track! I promise you won’t miss a hop again! Keep Your Blog Hops Organized! I need things written down right in front of me or I WILL forget. Every week I was missing blog hops and link up parties. I looked at tons of blog planners to try and find one with this feature to help me stay organized. But what I found out was that there simply wasn’t one out there! I spoke with my fellow bloggers and the general thoughts were that this was something that a lot of us needed! There are so many hops in every niche that it can be difficult to remember which ones are on each day, and what we shared from week to week. So, I decided to make a Blog Hop planner that was universal for all niches! This planner has a page for each day of the week and fits 10 link ups per page with space at the bottom for notes or to track your features! Before making this planner available, I shared it with a few fellow bloggers and you can read their thoughts on it here.